TOKYO, Aug 21, 2018 – (JCN Newswire) – Fujitsu today announced that Japan’s National Museum of Nature and Science has decided to register its FACOM128B relay-type automatic computer(1) as “Essential Historical Materials for Science and Technology.” The FACOM128B, manufactured in 1959 and still in an operational state to this day(2), as well as a number of associated materials, will be honored at a registration ceremony to be conducted on August 28, at which time a Certificate of Registration will be presented. Since 2008, the National Museum of Nature and Science has registered Essential Historical Materials for Science and Technology, with the goal of passing on to future generations the experience of their predecessors that has supported Japanese science and technology. The museum has worked to select and preserve materials representing essential results in the development of science and technology, that are important to pass on to future generations, and that have had a remarkable impact on the shape of the Japanese economy, society, culture, and the lifestyles of its citizens. The FACOM128B was a later model of the FACOM128 launched in 1956. The FACOM128 was the first relay-type commercial computer made in Japan, and featured the then advanced capabilities of a self-checking function for its internal processing, and a retry function. Later, the FACOM128B, seen as a highly reliable computer, was used to design camera lenses and the YS-11, the first Japanese passenger plane produced after World War II. Accordingly, the computer contributed to the development of science and technology during Japan’s period of rapid economic growth. The FACOM128B, along with materials relating to its design, production, maintenance, and operation, has now been selected as Essential Historical Materials for Science and Technology as a relay-type computer that led the industry at the dawn of Japan’s computer age. This is in recognition of its contributions to science and technology, as well as the fact that it has been preserved as one of the world’s oldest still-operational computers. The Fujitsu Relay-type Computer Technology Inheritance Project began activities in October 2006, with the goal of conveying the thoughts and feelings of the technical personnel involved in its development and production to the next generation by continuing to operate the relay-type computer. 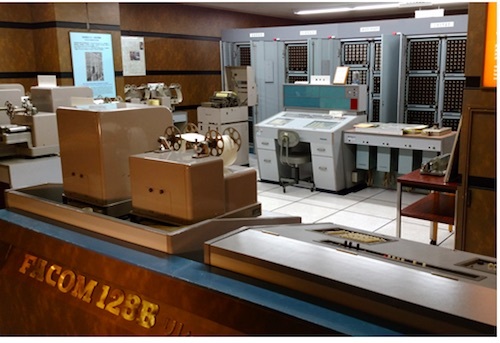 In this project, the technical personnel involved in the design, production, maintenance, and operation of the computer worked with current technical personnel to keep both the FACOM128B, which is fast approaching its 60th anniversary, and its sister machine, the FACOM138A, in an operational state. Going forward, Fujitsu will continue to collect, archive, analyze, and utilize materials relating to its scientific and technological results, including not only relay-type machines and other computers, but also telecommunications equipment and devices, as well as ICT solutions. As a result, the company will pass on its technical heritage to the future and contribute to technological transformation for the next generation. (1) Relay-type automatic computer A computer that uses relays (switches that operate magnetically) as logic elements, utilizing relay technology that was used in devices such as telephone switches, which gave Fujitsu its competitive edge at the time. (2) In an operational state to this day An operational exhibit in the Ikeda Memorial Room, one of Fujitsu’s facilities (located in Fujitsu’s Numazu Complex, Numazu, Shizuoka prefecture, Japan). The FACOM138A, its sister machine, is also preserved in an operational state in Fujitsu Technology Hall (located in Fujitsu’s Kawasaki Research & Manufacturing Facilities, Kawasaki, Kanagawa prefecture, Japan).